I had this in my hand to buy last week. I got very excited when I saw “matcha” but the tropical turned me off, and your review confirms what I thought it would taste like. One good thing to know is Trader Joe takes returns on ANYTHING. A matter of personal taste. The tea is excellent. I mix it with organic green tea and it slightly sweetens it. It does have a turn for the exotic and you have to be open to and appreciate tropical flavors. We had a party recently and added pure lemon aid ice and everyone raved. I have been a professional chef for 15 years. It’s all a matter of taste and preference. I would give it a try you can always take it back, Traders is great with its customer satisfaction addenda. I’m a big fan of tea (the high quality loose leaf kind, not the sugary processed kind). I never knew sweetened matcha tea existed; it seems counterproductive. I encourage you to try the Mighty Leaf Tropical Green Tea. I don’t know what the “tropical” consists of as it only lists the ingredients as flower petals, pineapple bits and “natural tropical flavors,” but it’s delicious and high quality tea, in my opinion. I love it hot or iced. This is so funny! I saw Matcha Tea Mix at Trader Joe’s and thought I just had to try it and today I picked up a can. I just made my forst glass and I love it!! I would prefer it unsweetened but, for now, this will do. I happen to love mago, passion fruit and green tea separately and enjoy them as a group. I kind of like it. It’s more tropical fruit than matcha flavored, to me, and a little on the sweet side, but I like the unusual combination. Regardless of my feelings on the matter, I appreciate your thoughtful assessment and will come check out your blog more often! Hi! 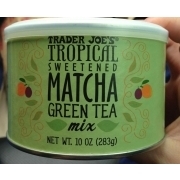 Today when I saw the tropical sweetened Match Green Tea at TJ’s I got really excited. You see I have been ordering Stash green tea with pomegrabte and raspberry from Amazon.com. It is a drink mix that is lightly sweetend. It comes in a tin foil packet, about 6 to a box, but I think you get six Boxes in one order. I mention this for anyone who wants to try a nice alternative. But getting back to the TJ’S tropical version…. well, I like it too!! I have to disagree with Profoundjester. It is not repugnant, quite refreshing. I admit that I use 4 teaspoons of the mix with 16 oz of cold water instead of 7 oz . Maybe that’s why Profoundjester found it gross. TJ’S just wants you to use up the can faster. After discovering green tea ice cream a few years ago.. and matcha green tea yogurt more recently.. and even more recently the matcha green tea latte, etc.. I have been a big matcha fan recently.. but only seem to be able to find it at asian food markets.. unless of course you want to pay double at Whole Foods.. When I came upon it at TJ’s I was so excited! Long story short, it was not my cup of tea either. Apparently, I am sort of a matcha purest and just want to taste matcha – not all of the other fruity flavors.. It’s bad enough that I can only find matcha powders with sugar, but then to discover this one so excited and then to discover the number one ingredient is sugar and then to not even taste much of a matcha flavor..!? I’m sure it may good for some.. I was just googling this tea for caffeine information, but I found your review. I have to strongly disagree. This tea was a super sweet and delicious treat. I tried it tonight in a smoothie – I did a tablespoon of the tea, with 2 cups spinach, 1/2 cup each pineapple and blueberries with ice and water and it was so good. I totally agree with your review! It tastes so artificial and cloyingly sweet. I completely agreed with your post when I tried this drink with water–as it suggests on the tin. HOWEVER, I tried it with Joe’s Low Fat Soy Milk, and it was actually DELICIOUS! If you still have that tin sitting lonelily in your pantry, I would highly recommend giving that a try. I’m sure it would work with good ol’ regular milk as well. Now I’m hooked!!! I like it. I really do. It’s matcha, but with a subtly sweet tropical flavor. Tasty! I will have to try it with milk, because with water it is.. well, watery. Matcha’s too expensive on it’s own so they added crap to make it affordable. I was so disappointed. I didn’t realize it was tropical when I bought it. I would have been shoveling spoonfuls of matcha dry. But…to no avail. I like this tea! At what store location can I buy it?